This publication covers the construction of residential decks suitable for weather-exposed applications with timber decking boards to timber sub-frames and either timber or steel posts. With this class of building the deck is designed for a uniformly distributed load of 2.0 kPa, a point load of 1.5kN and line loads. In addition to this the mass of decking supported by the framing is limited to 20kg/m2. In situations where treated timber (including CCA, ACQ and Copper azole) remains at more than 20% moisture content for extended periods these applications require greater consideration of the treatment level, fixings and fasteners used in such environments. It should also be noted that local government authorities generally have specific requirements relating to deck construction that must be adhered to, including building approval. The need for building approval relates to aspects such as the size of the deck, its elevation above ground and whether the deck is attached to the dwelling. 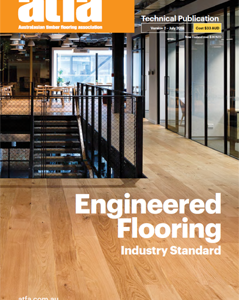 This publication provides a reference guide for the installation of laminate flooring laid as floating floors over structural subfloors. Floors of this type comprise a wood fibre-based core with an exposed decorative paper replicating natural flooring. The decorative or décor paper is protected by a melamine-impregnated wear paper and a stabilisation paper is used on the base of the board. The standard covers this type of flooring with a glueless locking system. When installing a laminate floor many aspects must be considered and this includes assessing the product used, the dwelling environment in which the floor is to be laid and the desired appearance of the floor. These aspects are covered by these guidelines as well as aspects relating to product selection, board widths and the available finish textures.